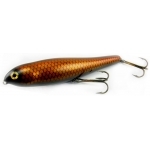 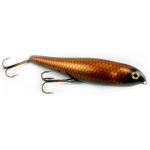 Top Cat™: The Top Cat is unique among the many side to side walking surface lures on the market. 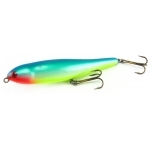 First and most noticeable is the incredibly detailed baitfish body profile. 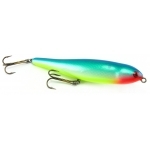 Hand carved gill plates, recessed eyes and 3D contours leave no doubt this is not a mass produced fishing lure. 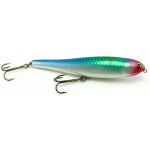 Rather than just walk back and fourth on the surface the Top Cat also has a rolling action that exposes the sides of the lure which presents a more realistic profile to predator fish lurking below. 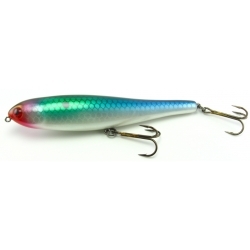 Multilayered paint schemes and xtra heavy harware makes this bait the cadillac of dog walking surface baits.